Trans fats, or trans-unsaturated fatty acids, trans fatty acids, are a type of unsaturated fats that are uncommon in nature but became commonly produced industrially from vegetable fats for use in margarine, snack food, packaged baked goods and frying fast food starting in the 1950s. Trans fat has been shown to consistently be associated, in an intake-dependent way, with risk of coronary heart disease, the worldwide leading cause of death. Trans fat formed naturally – this type of trans fat is produced in the gut of some grazing animals. That’s why small quantities of trans fat can be found in animal products like meat, milk, and milk products. Trans fat formed during food processing – this type of trans fat is created when hydrogen is added to vegetable oil (a process called hydrogenation) to make it more solid. Partially hydrogenated oils are used by food manufacturers to improve the texture, shelf life, and flavor stability of foods. About half of thetrans fat Americans consume is formed during food processing, and partially hydrogenated oils are the main source of this type of trans fat in the Unites States (U.S.). Eating trans fat raises the level of low-density lipoprotein (LDL or "bad") cholesterol in the blood. An elevated LDL blood cholesterol level can increase your risk of developing cardiovascular disease. Cardiovascular disease is the leading cause of death in both men and women in the U.S. 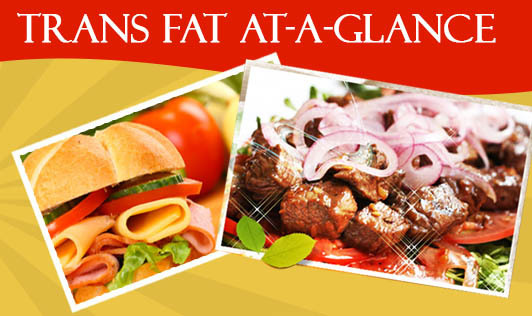 Therefore, you should keep your intake of trans fat as low as possible. Limiting trans fats is one component of a healthful diet that also includes limiting saturated fat and dietary cholesterol. Dietary fats are found in both plant and animal foods. Fat is a major source of energy for the body and aids in the absorption of vitamins A, D, E, and K. Fat is also important for proper growth, development, and maintenance of good health. The current Dietary Guidelines recommends that adults consume no more than approximately one third of their calories from fat to reduce their risk of developing chronic diseases (such as cardiovascular disease), while providing for adequate intake of essential nutrients. Use the Nutrition Facts Label as your tool for reducing trans fat in your diet – which may help decrease your risk of developing cardiovascular disease! Keep trans fat consumption as low as possible by limiting foods that contain trans fats formed during food processing. Trans fat has no percent Daily Value (%DV), so use the amount of grams (g) as your guide. Look for partially hydrogenated oils, a source of trans fat, on the ingredient list on a food package. Note: The Nutrition Facts label can state 0 grams of trans fat if the food product contains less than 0.5 grams of trans fat per serving. Thus, if a product contains partially hydrogenated oils, then it might contain small amounts oftrans fat even if the label says 0 grams of trans fat. When eating out, remember to ask which fats are being used to make the food you're ordering. You can also ask to see nutrition information, which is available in many fast food and chain restaurants, and choose a lower fat option.